HAVE YOU seen that C.C. Brian Wood has been welcomed back into the Canvey Island Independent Party (CIIP)? Dave Blackwell says, in the Echo, it’s great to have a County Councillor in the Party. That’s not what was said when he wanted to stand for election as a CIIP county councillor! I wonder what has changed?.. Are There Alternatives To Canvey’s Town Council? I can see where you are coming from on this matter. Do away with the Town Council. Let the Borough Council allocate a separate sum of money, to a selected Councillor representing Canvey on the Cabinet, which equates to half of the precept raised from the Town Council. That way more money is allocated to the island than is able to be used as of now – and the continuing waste of a further tier of administration is taken away. WHAT on earth is happening on the island? Canvey Town Council have now set aside some £25,000 to pay someone to stop dogs messing on the seafront and Canvey lake! Surely this money, if available, would be better spent on fixing the sea water pool on the seafront – or has the support dwindled away now the election has passed and the CIIP have won their seats? Three years of this dog warden’s salary would fix and maintain the pool. What is there to think about? Make the dog owners manage their dogs and the mess that comes from them. Use the community Police (that Castle Point Council pay for via taxes that are above the Council tax payment to the Police) to monitor and fine offenders. Once the word gets out, people will pick up after their dogs if there is a chance that they will get fined. 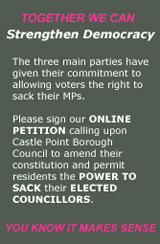 Canvey Island Town Council is a massive drain on Castle Point, as the figures on your site show. What is it for? What gain do the islanders get from this body? And does it distract councillors from their proper borough duties? Fewer and fewer go to Council or other committee meetings where Canvey is discussed. They just moan afterwards about how the mainland rules everything. And it is not just on the island – some of the mainland ones are just as bad. IT IS A SOBERING THOUGHT to be told by one of the world’s intellectual giants that journalists, and politicians, are failing to serve their country’s citizens by ignoring the most important issue of our time: the future of the human race. Dr David Hill’s remarks upon the article ‘Industrial Output Plunges In August’ are far too incisive to remain hidden away in a comments section. They are a reminder that even the recent world financial crisis palls into virtual insignificance when placed alongside the stark fact that the world’s population is likely to double by 2050 — and that none of our leaders or political parties are facing-up to the important issues that raises. While we concern ourselves with corrupt politicians and petty island politics, there are, in fact, those in the world scientific community whom are wrestling with these issues and calling upon Britain, in particular, to help. Dr Hill’s remarks go to the very core of what makes Britain’s people special — and they deserve serious contemplation by all readers. ‘Britain has lost its way in the modern world in terms of its once highly coveted industrial prowess since it was the world’s foremost technological nation that led the world some 100 years ago. ‘What has gone so badly wrong for us? ‘The answer is that successive British governments, from when Henry Campbell-Bannerman become the first Prime Minister of Britain (and was the first to officially bear the title of ‘Prime Minister’) to Brown today, did not, and still do not understand the ‘real’ strengths of the British people. ‘These reside as just two examples, stated in the creative and innovative thinking of our people determined by government reports by Japan (1980s) and Germany (1990s). This stated that up to 55% of the modern world that we see today was created through the thinking of our people. But the most important fact is that 75% of this leading-edge thinking came from the British lone inventors and not our universities or advanced centres of research. ‘Therefore this country needs, more than anything else, the technological catalyst and system putting in place where our innovative thinking can be released. For this is the only thing that will deliver our nation in the future from increasing poverty and continual economic decline. ‘This need is for the establishment of the ORE-STEM system of innovative and creative development in the UK, and where it is the only viable answer to our problems. Indeed it was one-hundred percent backed in 1997 by the world’s pre-eminent scientists and engineers at that time. But our government took no notice. ‘Unfortunately politicians, and journalists in this respect, are also silent about this real need for change for our nation — and do the British people the most dire disservice that they ever could possibly do through this ignorance. I think some of your editorial was rather rude to the councillors of the CIIP (except it seems for John Anderson whom you praise?). We ALL tried our best to stop the tories voting ‘yes;’ but we all know, and people of this Island know, it was a done deal. Please do not criticise people who are only trying their very best for this Island. I used to sit at home and criticise, write letters, etc; but then I joined the CIIP. I went out and got elected and re-elected and I do my very best. I give 110% for the residents I represent; but I cannot always get the result they or I want and, as the saying goes, ‘you cannot please all of the people, all of the time.’ BUT at least we are out there trying and fighting. Please Sir, I do not want praise nor medals; but neither I nor my colleagues deserved the severe, harsh words you blasted upon us. You could remove it completely if you so wish and tell the Islanders the TRUTH: we tried our best, the fight is NOT over, and we will do whatever we can to STOP the Tories concreting over this island.